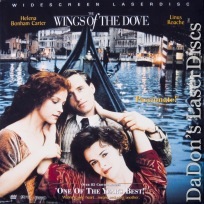 "A Sleek Adaptation of the Eponymous Henry James Novel"
The Wings of the Dove 1997 - 102 min. - Color Genre: Drama Rated R Country: USA LaserDisc Movie Review: A social-climbing young woman gains a foothold in the late Victorian upper crust by virtue of her wealthy and cultured aunt's social connections, but finds marriage to her true love, a poor hack journalist, incompatible with her new station. She cooks up a plan to use her lover to bilk a guileless and fabulously wealthy American woman of her considerable fortune, but putting the scheme into action sparks painful conflicting emotions. A sleek adaptation of the eponymous Henry James novel, with the source material's bitterness tempered by a more sympathetic characterization of its heroine. Thanks for Visiting DaDon's Rare LaserDiscs ! Reviews, Articles, Newsletter and Information for Movies on LaserDisc LD Laser Disc, LazerDisc.